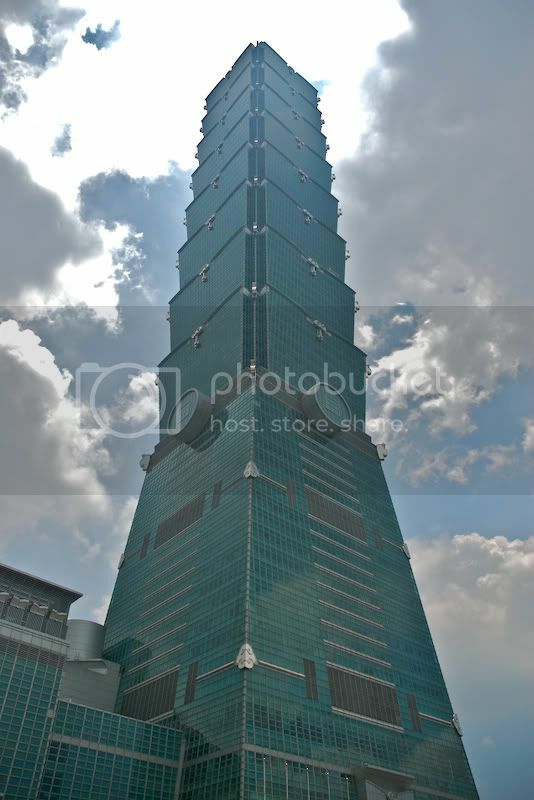 Taipei 101 is not a lesson in the capital of Taiwan, but is the name of a building that currently holds the title of "Tallest Building in the World." Note: this title is disputed with a building in Dubai called Burj Dubai, but they do concede that Taipei 101 is taller. Higest structural roof: 1,474 feet. Highest occupied floor: 1,441 feet. Fastest building elevator: 37.5 miles per hour. About that last fact, the elevator will take you from the building's 5th floor, a mall, to its observation deck on the 89th floor in 36 seconds. Your ears will pop about 5 times along way. Pictured above, the bulding isn't necessarily attractive, but its an impressive feat of engineering. 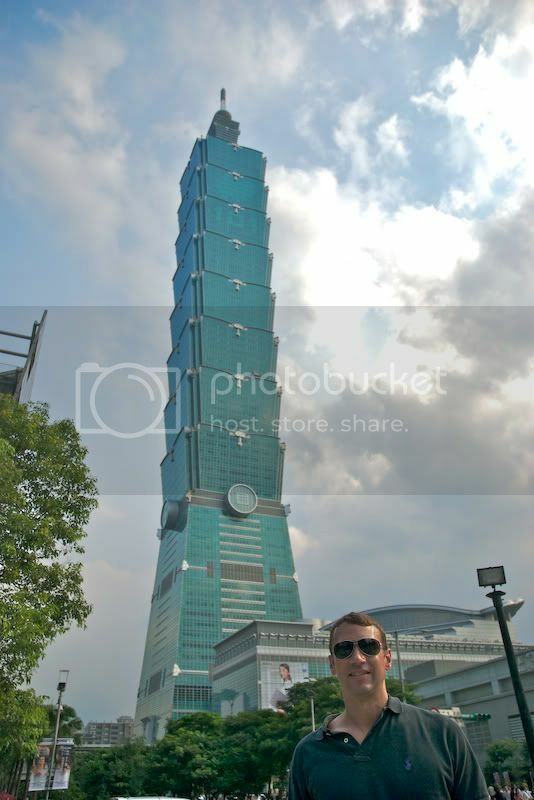 Taipei 101 is hyperbole in many ways. 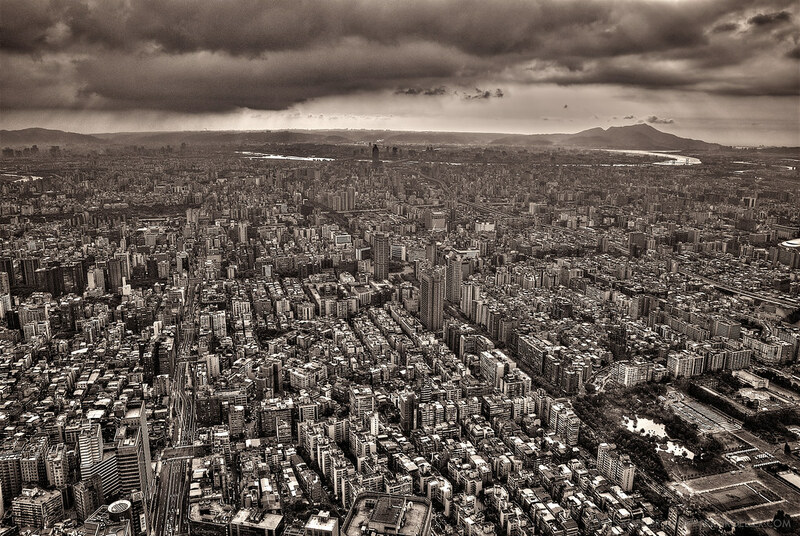 The second highest building in Taiwan, also in Taipei, is a mere 51 stories. The building isn't terribly practical either. There is ample office space available in Taipei, and the growth and development of the capital city, while impressive, is not on the break-neck pace that would warrant such a flashy architectual icon. Rather, the building serves as a giant middle finger to China and rightly so. Not surprisingly, the next building to hold the title of World's Tallest is currently being constructed in Shanghai. Middle finger back to Taiwan. To put this in context, its important to understand a bit about Taiwan. Most of the Chinese people I know are in fact from Taiwan, and many of them are readers of this post; each of whom I'm certain will post some rebuttal to this crude history. (Sorry Michael Lee, I don't have a history of Cantonese Chinese people). Aboriginal Taiwanese are the original, ancient settlers of the island of Taiwan. They are ethnically linked to Malaysian and Polynesian cultures and are still prevelant in Taiwan today. Pre-War Taiwanese lived in Taiwan prior to the Chinense civil war and speak a distinct language, not surprisingly, called Taiwanese. Post-War Taiwanese settled on the island as refugees of the Chinese civil war or followers of Chiang Kai-shek. Modern Taiwan is mostly the product of this last group, a mostly Mandarin-speaking, capitalist and industrial culture part of the 4 Asian Tigers that were an economic phenomenon during the 1980's. Culturally, there is some lingering nationalism over being "Taiwanese". To many, being Taiwanese means you or your family lived in Taiwan before the war. Otherwise, you're merely "from Taiwan." Reader comments on this point appreciated. During the Chinese civil war, Communist victories forced many to flee the mainland and settle in Taiwan. This exodus included many business leaders, intellectuals and other notable members of Chinese society that helped form Taiwan into the formidable economic and social force it is today. Chiang Kai-shek claimed authority over all of China, under the name of the Republic of China, a constitutional republic not dissimilar to the United States. However, in 1949, the People's Republic of China claimed victory and authority over all of mainland China, inluding Mongolia and Taiwan. This dispute is still unsettled as of today. During the Cold War, western-allied nations generally recognized the Republic of China to be the sole authority over all of China, while Communist-aligned nations recognized the PRC. Today only 24 nations recognize Taiwan as an independent nation, while most have established diplomatic ties soley with the PRC (including the United States since 1972). Curiously, half of the 24 nations recognizing Taiwan are in Latin America. Recently, Costa Rica ceased its diplomatic ties in favor of China, sparking a political crisis in Taiwan. China has softened its approach to the "Taiwan problem" in recent years, adapting a stance of "reunification" for the betterment of all of China. Beijing points to successes in Hong Kong and Macau, Special Administrative Regions of China under the "One Nation, Two Systems" principal, as evidence of how Taiwan could succeed under Chinese rule. Given this, its obvious that China has much to gain from the success of Hong Kong and Macau, and would take great delight in seeing Taiwan stumble, or outright fail. The United States has a long and supportive relationship with Taiwan, but has stopped short of entering in to defence treaties and any other gestures that might damages its delicate relationship with China, a key trading partner. The current Taiwanese administration has been strongly in favor of indepedence, a move the United States has opposed only to prevent rocking the boat severely with China. Democratic principles aside, there is big money at stake. The food in Taiwan is terrific. I didn't eat much distinctly Taiwanese, but the variety was impressive and each was extremely well executed. The shopping is typical of what I've seen in Asia, lots of super high end boutiques and marquee brands. Every building seems to be on top of a mall, and that on top of a food court. Gappers would be amused (more than concerned) by Net, a Taiwanese facsimilie that looks very Gap-ish right down the font of its logo. Any visit to Taiwan must include a trip to check out the night markets. These are better than flea markets; worldly bazaars selling food, clothing, housewares, pets - you name it - and all cheap in a super-frenetic, capitalistic fashion. Also of note is the electronics market, where vendors peddle dirt-cheap electronic goodies, computer parts, cell phones, radios, TV's, etc. Taiwan was built on silcon and it shows at the electronics market. Sadly, most of the bootleg software vendors are gone. Sorry, Vince...no Office 2007 DVD for you. I would also give Taiwan high marks for its nightlife, but it can be hard to come by if you don't have local connections. 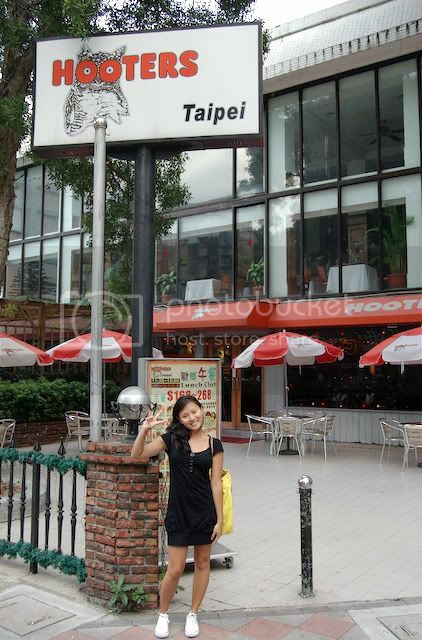 Overall, Taiwan impressed me but I'm not sure I would recommend it as a world destination. If you're there, you'll have a good time, but its not quite Tokyo or Hong Kong. Given the ambitous plans the city has, I would give it a few years; its definitely on the right path. I'm glad I got to visit. I have so many friends who are MIT, I had to see it for myself.